Iris is an exquisite yarn and most definitely deserves its place in the Pure Bliss Collection. With its beautiful blend of superfine merino and cashmere, it creates a super soft fabric which still gives clear stitch definition. As I swatched the yarn, my mind wandered to the colour palette that I wanted to create. In contrast to the rustic theme of my other new yarn this season, Aymara, the fibre gave me the sense of sorbet pastels and classic neutrals, I was already thinking about the location I wanted to use for the shoot before I had even thought about the designs – my friend Siobhan’s house! 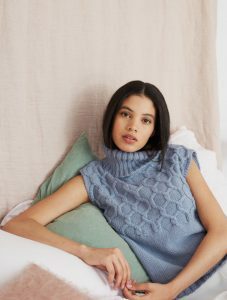 It had the perfect interiors to showcase the eventual collection, it had the colours and soft, plump furnishings to provide the sensual backdrop to the knits. 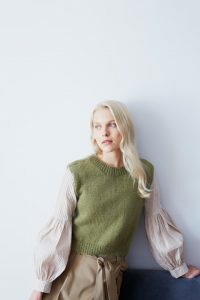 Iris creates clarity of stitch so is perfect for the cables in this tank top Jessamine and generous sweater Calla. JESSAMINE – shade Dolphin 07. CALLA – shade Pigeon 02. For those who want a quick and easy knit this simple sleeveless top Hazel is perfect. HAZEL – shade Turtle 06. Jarred is a a woven stitch stole that is super soft against the skin. Knit it and you won’t want to take it off. 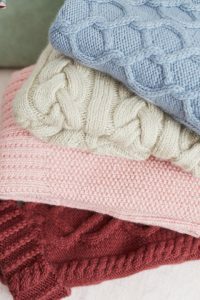 The collection of ten knits features combinations of classic stitches and styles. Debbie Bliss Iris – Pure Bliss Collection. I love the pattern Ren in the blog for Iris yarn. where can I find that? Am so disappointed that Debbie Bliss yarns are so difficult to find in the states now. Rialto DK is my all time favorite all around yarn. Hope it’s available in an array of colors soon!